If you have a dental crown fall out, don’t panic — that is not too unusual, especially for a temporary crown. Calling your dentist right away will help to ensure that you do not damage the tooth or your soft oral tissues before it gets fixed. In the meantime, follow the instructions detailed below for a damaged or lost dental crown in Mouth Pleasant. The #1 thing to remember in any dental emergency is to keep your cool! Remove the crown from your mouth. Rinse your mouth with warm water or mouthwash to make sure you do not have any shards remaining. If the tooth is not damaged, you may be able to reattach the crown with dental glue or a denture adhesive. Rub your tongue gently over the tooth. If there are any jagged areas that could injure your tongue or soft oral tissues, you may need to cover them with wax or just take extra care not to come into contact with them. Call your emergency dentist in Mount Pleasant to find out what you should do. Sometimes, it is best to come into the office right away for a new temporary. Other times, you may be able to hold off until your next appointment (if it’s soon). If you have used dental glue to reattach the crown, take extra care when you are eating. The bond is less secure than it was before, meaning the temporary crown is at a high risk of falling off again. Whether it is permanent or temporary, there are some things that you should keep in mind to ensure that your crown stays healthy and functioning properly for its duration. 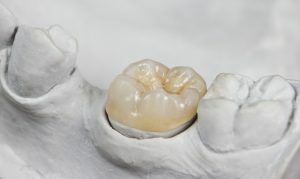 With proper care and maintenance, a permanent crown can last for decades. Avoid biting down on extremely hard, crunchy, or sticky foods with a dental crown. Brush and floss your teeth as recommended. Concentrate on the area at the base of the crown to prevent plaque and tartar buildup, which could put the tooth beneath it at risk of further decay. Wear a customized mouthguard if you play sports. Sports injuries are the #1 cause of dental emergencies, often involving broken crowns. Get treatment for bruxism, or nighttime teeth grinding and jaw clenching. Avoid habits like eating ice, biting your nails, and opening packages with teeth. All of these tips can help to protect your crown — but if the worst does happen to you, remember that your dentist can get you out of that sticky situation and back to good oral health once again! Dr. Robert C. Sikes is a general dentist offering superior dental care, including emergency dentistry services, for patients in and around Mount Pleasant. If you have a broken, lost, or damaged crown, do not hesitate to get in touch by calling the office at 903-572-9720.